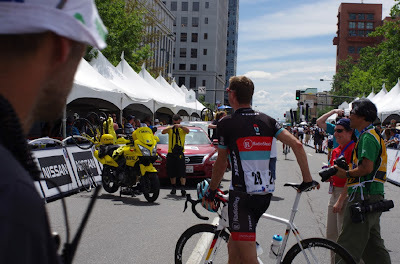 It was the last and final day of the stage race and we were all a bit tired and ready to start celebrating the end of an entire week of bike racing. 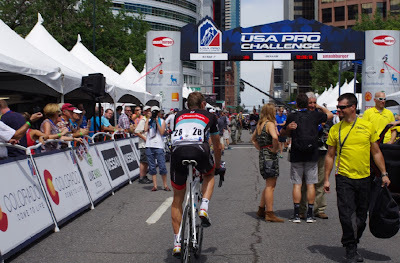 I was standing near the sign-in stage this morning in Denver, looking for something different to shoot, when Jens Voigt suddenly appeared. 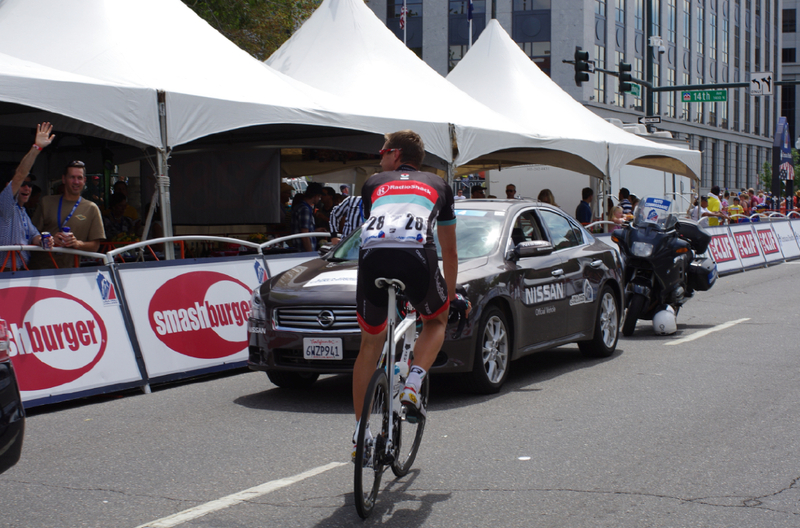 Darting from side to side through the lengthy row of VIP tents lining the start area, I heard him call out "cookie?" "cookie?" "cookie?" Jens - Do I smell cookies in that VIP tent? Jens - Got any cookies in there? 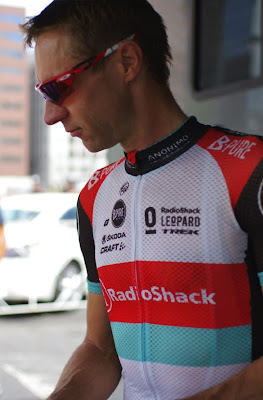 I realized Jens Voigt was searching for a morning cookie and was not going to stop until he found one. You can't imagine the look of surprise on the faces of the fans inside the VIP tents as Jens Voigt rode straight up to them asking for "cookie?" Wait, aren't we the fans supposed to be asking Jens for something? 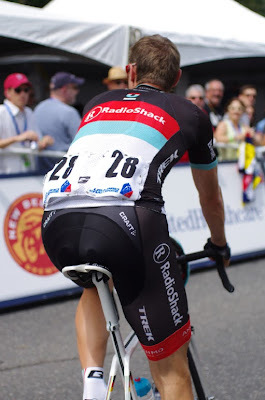 I watched Jensie's zig-zag pattern in total curiosity. Jens - Got any Cookies? 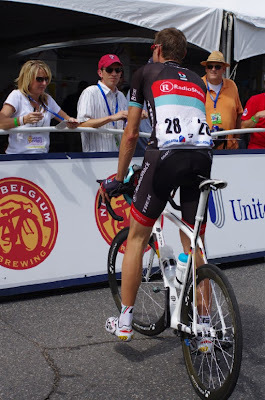 You know that steadfast determination that Jens is known for in bike racing - well the man has the same determination when it comes to "cookie?" Jens - Just one cookie? Jens - Can I please have a cookie? Jens - More VIP tents up there ... must find cookie. 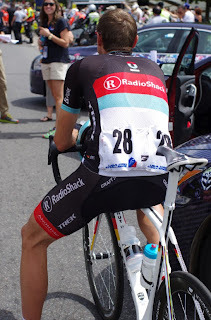 "But I want an espresso now - ooh look there is the Rapha van, " he added, spotting the van just up ahead. I looked up and headed straight for the van, I had been there myself just thirty minutes prior. "Can I cut in line to bring Jens Voigt an espresso please?" I asked of the Barista now on day 7 of making hundreds of espressos. 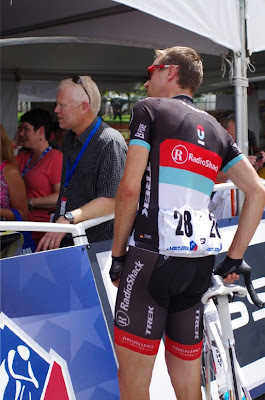 "Sure you can if you tell Jens I want a hug," replied the nice Rapha guy whom I had visited almost daily during this tour. "Okay, no problem, I will tell Jens that; he wants an espresso." 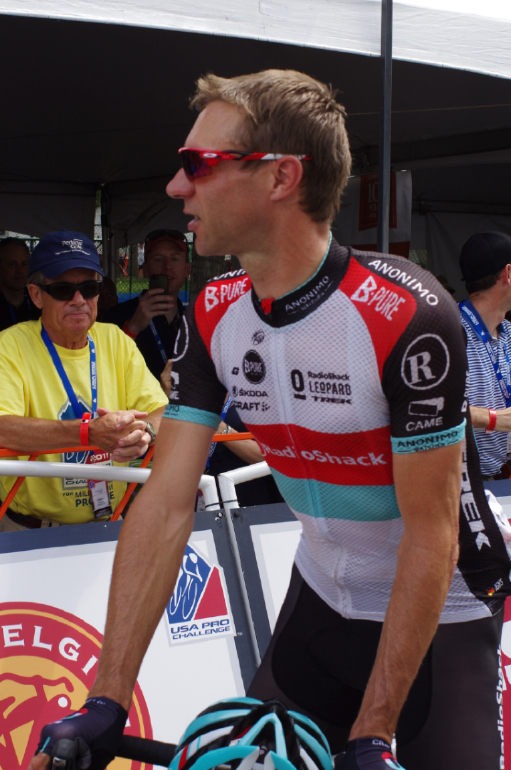 Right then Jens Voigt rolls up on his beautiful new Trek bike and the Rapha guy realizes I am not kidding. 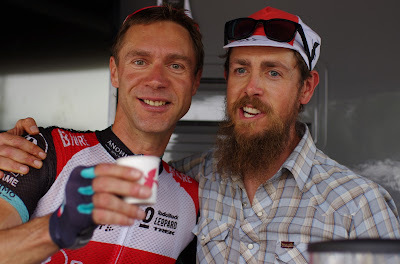 "Hey, there you are" I say to Jens, "I was going to bring you an espresso, but this guy says he wants a hug." 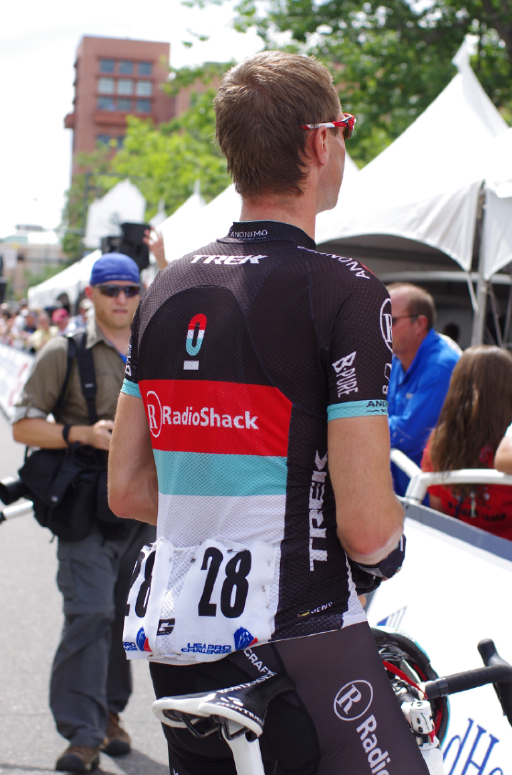 "Ok," says Jens, "a man hug." And he goes over and throws his arm around the shocked barista. And so here they are - espresso friends for life - Jens Voigt and Patrick the Rapha Espresso Guy. 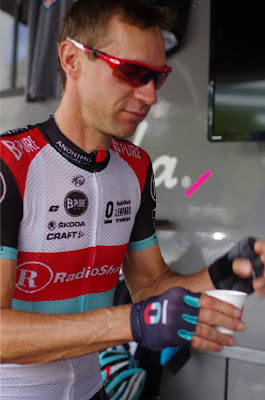 Next thing you know Jens Voigt plops himself down on the finely crafted wooden bench next to the outdoor Rapha espresso maker, and you wouldn't believe the look on the random fan's face who happens to now be sitting next to Jens as he realizes um Jens is having a coffee with me. So there sits Jens Voigt as if he just walked into the local coffee and donut shop ready to chat with the locals. 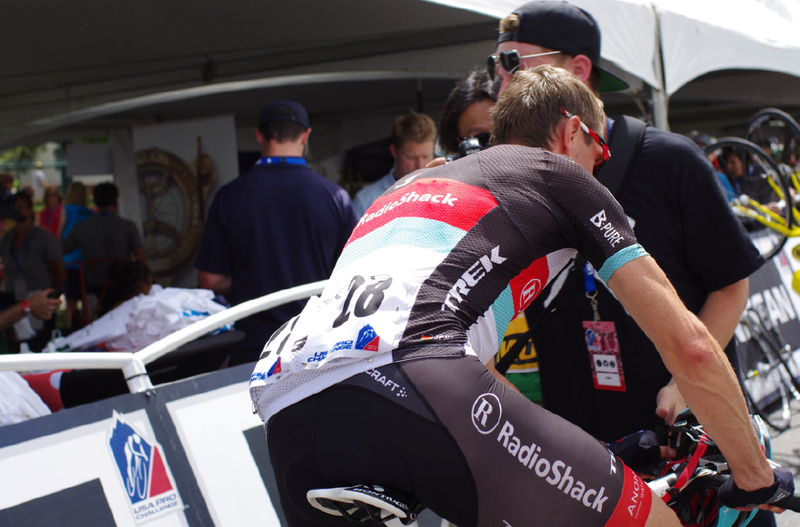 "When does the race start," Jens asks. "You have 9 minutes," I calmly reply. "Ok thank you," he says in a fine mood as he sips his little paper cup of the finest espresso seen across the Rocky Mountains for the past week. Off I run to get inside the first Media car to hit the route this morning and take two glorious FAST paced laps around the city of Denver. 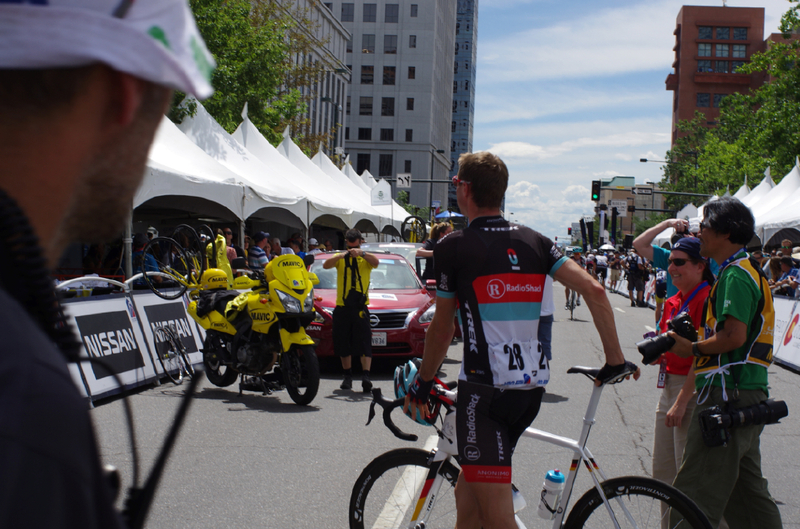 The huge crowds of fans cheered as we sped through the city blocks. 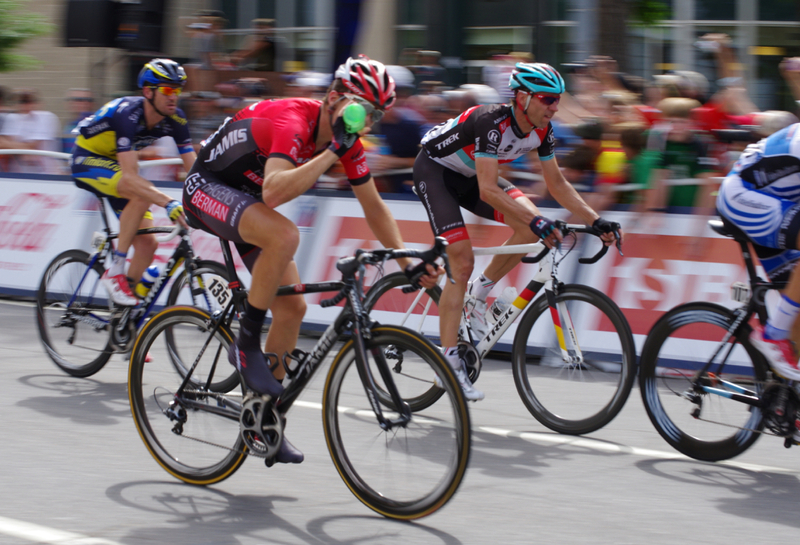 Buckled in and holding on tight in the corners, I knew the speed of the car was justified - Jens Voigt was behind us somewhere, powered by cookies and espresso. What's in your water bottle? Got any cookies? 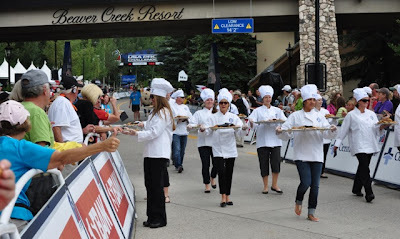 Stage 4 into Beaver Creek - Project Cookie Delivery, 3:00pm sharp. If Jens had been aware of this tradition of handing out free fresh hot chocolate chip cookies in Beaver Creek, we definitely would have seen another 80-mile breakaway. 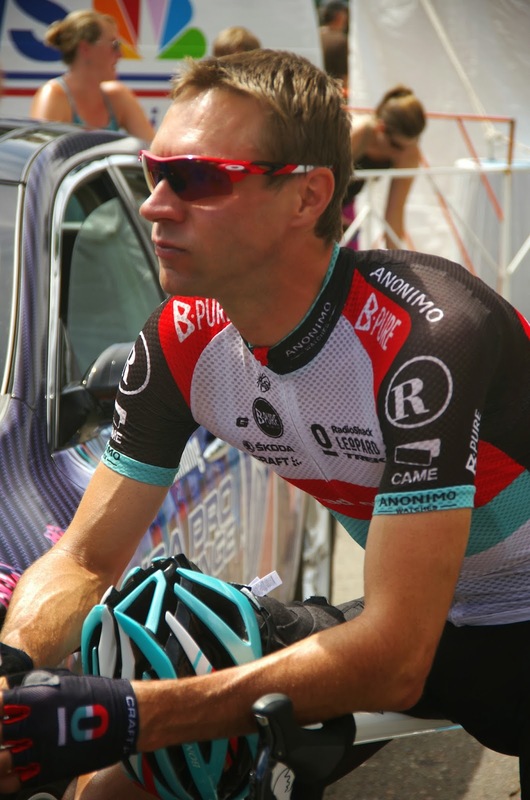 Update May 2014: Jens Voigt was at it again at the 2014 Amgen Tour of California... this time it was a candy apple pre race Big #17 for Jens Voigt.